Orangefield Park in East Belfast is a vast public park with many facilities. The playing fields include soccer pitches, tennis courts, and a velodrome. The park opens twenty-four hours a day, seven days a week. In 1934, the land was still owned by the Blakiston-Houston family as part of their Orangefield Estate. The family offered the demesne to the Belfast Corporation, a forerunner of today’s City Council. The corporation, though eager to buy the land, thought the price too high. After negotiations, the parkland was purchased in 1938 for £20,000. That would equate to around £1,000,000 today. To begin with, much of the land in 1938 was developed as housing. The area off Castlereagh Road was built on and named the Orby housing estate after the 1909 Derby winner. Further development work stopped the following the year with the outbreak of World War Two. The Belfast Corporation drew up plans for the parkland in 1947. 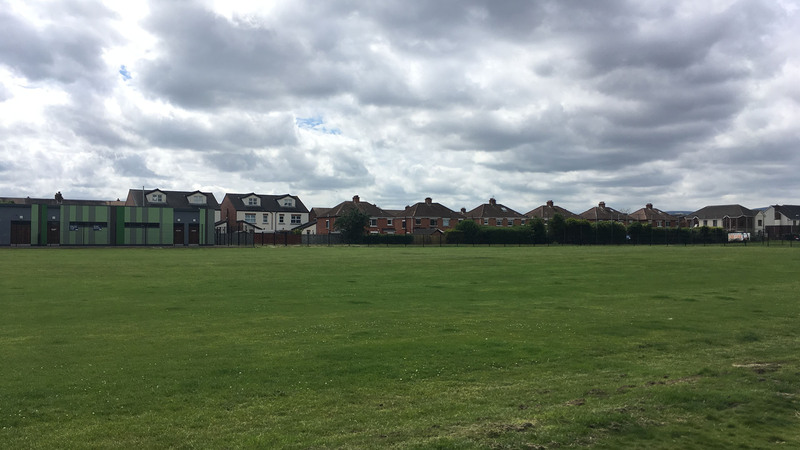 The original proposal featured football, hockey, and cricket fields, a polo pitch, cycle track, bowls, quoits, marbles pitches, and outbuildings. New developments such a the Castlereagh Road Tesco and Orangefield Crescent covered this area including the polo pitch after 2002. The ground around Orangefield Crescent was once loaned to Glentoran Football Club as a practise ground. Orangefield House in East Belfast as it stood in 1903. The grounds of this mansion house were a camp for the US Army between 1942-1944 and also housed German prisoners of war during the latter years of the war. Photo from Old Belfast Photographs on Facebook. Copyright Public Records Office Northern Ireland. Orangefield House was the familial home of the Blakiston-Houstons. It was built for John Blakiston-Houston around 1857 on the site of an older 18th-century mansion. The two-storey house faced west with a central bow flanked by three bays. A smaller service wing stood to the north with prominent chimneys. By the outbreak of war, it already lay vacant. The ruins remained until the 1970s when the girls’ school extension was built in its place. An old brick-lined well at the house was uncovered and the bricks now form chimneys at the printer’s workshop at the Ulster Folk and Transport Museum in Cultra, Co. Down. Four gate lodges marked the north, south, east, and west entrances to the mansion and grounds. The northern pair at the Knock River on Orangefield Lane stood at the main entrance. The surrounding parkland ran from Grand Parade to Castlereagh Road and Knock Road with the old railway line to the north. To the north of the house, was the Home Farm. It included a school, a corn mill, a water mill, a mill pond, and mill race. Managed by the Buller family, it lasted until the 1930s. Today, playing fields stand on the land by the river. 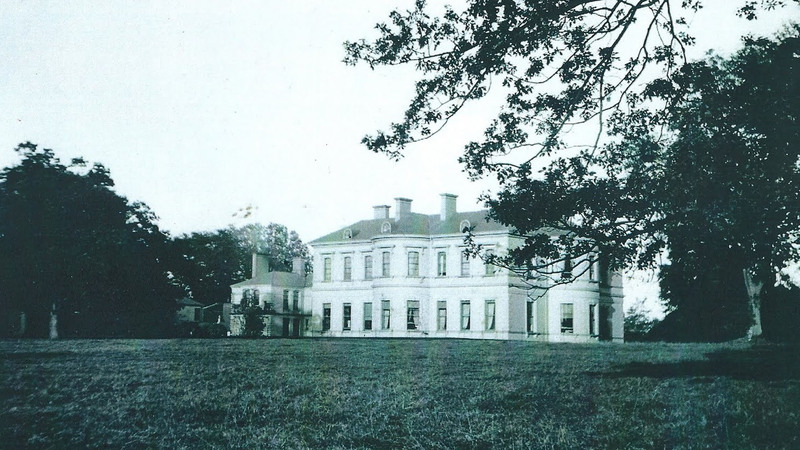 As American GIs arrived in Northern Ireland, some found themselves based at Orangefield House. The US Army set up camp and trained in the area between 1942 and 1944. After 1944, a military hospital and prisoner of war camp operated in the grounds of the mansion house. Sometimes, it appears in lists as Camp 161 – Grangefield Gloucester (MH), Belfast. Miswriting Orangefield as Grangefield is a simple mistake to make. In fact, the Orangefield camp was an annex of Camp 14/172/682 – Holywood, Belfast. With a heavy military presence in place, precautions such as smokescreen oil burners were placed along Houston Park. At the time, this road led to Orangefield House. In the event of further attacks from German bombers, smoke would disrupt their view of the camp and hospital. Many prisoner of war camps opened throughout Northern Ireland. Up to 13,000 German prisoners of war came to the country between 1944 and 1948. This number was around 2% of the total captured Germans in Great Britain. Lissanoure Camp, Loughgiel, Cloughmills, Co. Antrim. Gosford Camp, Markethill, Co. Armagh. Elmfield Camp, Gilford, Co. Armagh. Holywood Camp, Jackson Road, Belfast, Co. Down. Rockport RAF Camp, Belfast, Co. Down. Craigavad Camp, Belfast, Co. Down. Dungannon Camp, Dungannon, Co. Tyrone. Monrush Camp, Cookstown, Co. Tyrone. Prisoners of the Wehrmacht, Kriegsmarine, and Luftwaffe wore white and grey armbands. As more arrived in Northern Ireland after D-Day in 1944, they became a common but still curious sight. Schoolchildren would make their way to camps like the one at Orangefield to chat through the fences with the enemy. Captured men exchanged cigarettes for hand-carved toys. With the war’s end in 1945, restrictions relaxed. Prisoners of war worked the land in the countryside, fixed roads, and repaired buildings. By Christmas of 1946, the fraternisation ban ended and some locals invited the defeated young Germans into their homes. Records show that two of those Germans died while at the military hospital. Obergefreiter Friedrich Selbach from Bonn, died on 26th July 1945 aged thirty-eight. Rudolf Schwarz who served in the German Navy, was fifty-three when he died on 29th May 1945. Both men were first buried in Belfast City Cemetery before exhumation and repatriation to Cannock Chase German Military Cemetery. Playing fields in Orangefield Park in East Belfast stand on what was once farmland attached to Orangefield House. The land was a campsite for the US Army from 1942-1944 as they prepared for D-Day. Photo taken on 2nd July 2017. Copyright Scott Edgar - World War Two Northern Ireland. During the 1950s, more of the Orangefield land was bought up on which to build more housing and the Orangefield High Schools. Even then, the remaining parkland offered an escape from the narrow smoke-filled terraced streets of East Belfast. Wildlife included wrens, kestrels, redwings, tree creepers, corncrakes, and kingfishers. Many have returned in recent times with the clean up of the river and construction of the Connswater Greenway. Demolition of the former Orangefield High School buildings took place in February 2017. The high school in East Belfast closed in June 2014 due to dwindling numbers and underachievement. Before the demolition, the school appeared in the hit BBC drama The Fall. The boys’ school opened in 1957 under headmaster John Malone. A girls’ school opened three years later after issues with the foundations. Years later the schools would merge and become coeducational. Van Morrison was among the most famous past pupils of Orangefield Boys’ School. Almost nothing remains in the landscaped park, along the Greenway, or on the site of the old school buildings to hint at the location of the house, gate lodges, American military camp or the prisoner of war camp. If you enjoyed this post on "Orangefield Park, Belfast, Co. Antrim", please share with your friends and followers.